One of the fantastic Manchester ‘Bee in the City’ art trail sculptures will be flying into its new permanent home at Manchester Royal Eye Hospital (MREH) on Monday 15th October. For over 25 years, Manchester Royal Eye Hospital and the Henshaws charity have been working together to help people with sight loss. To celebrate this amazing partnership, the colourful ‘Bee-yond Expectations’ sculpture will be landing at MREH. 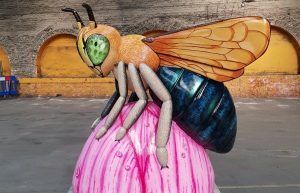 This special Bee from Henshaws, sponsored by the NHS, was created by Wild Portrait Artist and developed with visually impaired people during the design process. It is sensory themed with tactile and multi-sensory elements, including audio description and braille transcription, ensuring the art is accessible to all. Patients, visitors and staff are invited to a special event in the MREH atrium from 12.00 to 2.00pm on 15th October to welcome the Bee. More information about the Bee is at https://www.henshaws.org.uk/beeyond-expectations/. There will be short speeches by John Ashcroft, Chief Executive of MREH, and Robert Cooper, Director of Community Services at Henshaws, who will welcome the sculpture to the hospital. Refreshments will be provided, and Dave Steele, a visually impaired poet who has the eye condition retinitis pigmentosa, will read some of his inspiring poetry to mark the occasion. Volunteers will also be on hand at the information desk to answer any questions about Henshaws’ services.